Herbs, cauliflower, and cottage cheese blended and spooned onto Wonton wrappers for the ulimate cullinary creation! 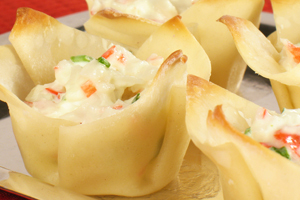 Place wonton wrappers in a single layer on the baking tray. Spoon cauliflower mixture onto baked wonton wrappers.